No one wants to retire broke and if you don’t want to be that person there are things you can do to make you richer before retirement. How much do you need before you retire? Only you can answer that question because I don’t know what type of lifestyle you want to live or how much debt you will have etc. Talk to your financial advisor for clarification if you have one or make the call yourself. It’s nobody’s business what you do with your money but your own. No one can tell you how to spend it, save it or invest it but you. Believe me when I say some people always stick their nose into the finances of everyone else but their own. I’ve always said that no one will care more about your retirement but yourself. If you believe that then you have already invested time into finding ways to make sure your retirement days are comfortably padded with enough cash to fund what you want and need to do. You earn the money, you do what you want with it. BUT…there will always be someone who thinks they can give their opinion with what you need to be doing with your money. I don’t plan to retire early (yet) but what I do know is that every dollar I earn will go towards our retirement and help to raise our son while paying for other budgeted expenses. Family first. I watched the video below titled Are you investing enough in your RRSP? today and one thing personal finance expert Rubina Ahmed-Haq said caught my attention about retirement years. “What can I do to get richer before I retire?” she said and that’s when I scratched my head wondering what would I do? In the video she briefly discusses what we should be doing with our money in our mid 20’s, 30’s and 40’s. Like I mention your money is your own to do what you please but she has some important tips for all of us. Mid-20’s- Pay off your OSAP student loans. So many young people try to get to the top of the ladder before they have learned to climb. I agree with Rubina that killing student debt is very important in your 20’s. If you have credit card debt from school get rid of that too. Carrying consumer debt is a heavy load at any age but when you are just starting out and want to get married, buy a house and car etc. it can really put a hold on some of those things. Sure some people might not want a house, kids or to get married BUT paying off debt at any age is a smart move. I also agree that these are the years that you have the most disposable income because you have no mortgage and can save, save, save. I did however have a mortgage since I bought my first house at 21. kids etc. I didn’t care about buying “stuff” all I wanted was to be a homeowner. Not many young kids think about home ownership before graduation and follow through with it these days. With the costs of education going up every year it’s no wonder. She suggests in your mid-20’s to put 30-40% after tax income away. You read that right! That is a big chunk of money and depending on how much you’re earning that might not be possible but don’t fear, do the best you can. Mid-30’s- Rubina says is the busiest time when there may be a mortgage, kids, education funds (RESP), holidays etc. Unfortunately we didn’t have any of that except the mortgage up until this year when we had our son and we are nearing the end of this age category. She suggests although it’s an “expensive time” to try and keep up with retirement savings. Although we went ahead and paid our mortgage in full this past year we were faced with people asking why we didn’t invest the money instead. Again, our money, our decision and we are happy with that decision. The entire time we were investing in our RRSP’s, Pension plans and TFSA’s but balancing it with paying off the mortgage. We certainly could have packed more into retirement but now that the mortgage is gone that is what we have done. Although I still have plenty of RRSP room I plan to catch up and max out every year. Every bit of money you pack away for when you retire is all going to help you in the end. Mid-40’s– People are choosing to have kids later in life as we did so like Rubina mentions mid-30’s spills into this category. Keep putting as much as you can away to retire while paying down your mortgage or whatever you choose to do. Only you can make that decision and yes it is possible to save for your retirement if you have a lower-income. Retirement savings is not just for those who have money kicking around, most people don’t. When Rubina mentions to do a re-balance I would suggest the same because priorities at least for us will change when we are in our 40’s. Our son will still be young and we want to go on holidays with him (Disney, UK) and potentially get a bigger house or buy an investment home. Even though our mortgage is paid the income we bring in is all spoken for even if it’s sitting in a bank account waiting for us to find some time to use it. So her question still stands: What can I do different to get richer before I retire? I thought about a few things I would do in my 40’s that might help us bring in more money to help us retire happier. Although some of these are obvious it wasn’t an easy question to answer. I really wish I had the answers BUT at least I’m thinking about it which I believe is important. The only problem is Rich and Risk are always on the same page. Don’t ever forget that. Buy an investment property or two and if all goes well continue to buy and have the tenants pay the mortgage for us. My parents did that and when they chose to retire they had rental income coming in that was money in their pocket aside from maintenance fees. We could sell this house and move to a city where houses are priced less but we get more house for the money provided my career comes with me. We could re-balance the budget to save more money. I could work more hours or ask for a raise even though in our 40’s it’s that time in our life. where we are making more than ever before. Don’t be shy to ask. I could create passive income or dividend income by learning how to invest our money. Continue to live a frugal life-style. Write a book… now that’s being optimistic. Win the lottery… I wish! What would you do in your 40’s to get richer before you retire? It was a busy week again for us only because I’m still working 6 days a week. When I get my day off it’s filled with appointments, cleaning, paperwork and the list goes on and on. We did manage to make our way over to The Goodwill store to see what we could find. Family time is great! We have always enjoyed taking our time going through all the second-hand shops in town before our son arrived and now we are taking him. My wife bought a brand new pink v-neck sweater that she says would cost much more than the $6.00 she paid. It’s amazing what you can find. I also found an INXS CD that I’ve been looking for so I got what I wanted. I never buy my CD’s full-price because typically I can find what I want if I wait on the shelf at Value Village or Goodwill for a couple of dollars. The good news is I have family day off this coming Monday and I WILL be spending the entire day with my family. The blog was a smash hit this week with CBB posts being shared over at Rockstar Finance once again (thanks J.Money) and someone else shared via Flipboard app which drove boatloads of traffic my way. If you have a question that you would like to ask Mr.CBB fill out the Contact Mr.CBB form on the Home Page and send in your questions. Mr.CBB will look in his mailbag weekly and pick a question to answer on the blog. Did you go overboard for your wedding day? I received this email from CBB fan Colleen who was thrilled to share her deal with all of us. At the end of November 2014 our van died and $250 later it was towed home. It was a bad time of year right before Christmas but we still had my son’s car to use. 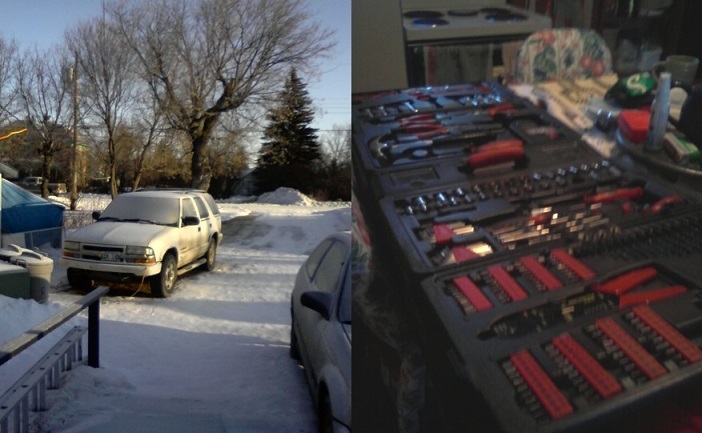 This dead van was an $800 purchase 1.5 years ago and it came with a set of winter studded tires on rims and was a 1998 Caravan. That was a good deal but now the hunt was on for another vehicle. We were in need of something that could carry a wheelchair as my son has Multiple Sclerosis which was going to be tough on our meager funds. Surprisingly my other half found a vehicle and it was a pie in the sky sort of dream. It was a 2002 Chevy Blazer SUV with an asking price of $3000.00 or best offer. It had just been safetied in Sept 2014 (a must to insure a vehicle in Mantioba). The negotiations started via email when my other half asked what the lowest amount he would take was and the seller dropped the amount to $1800.00 right away. We replied that we wouldn’t even insult him with our meager offer but thanks for taking the time to answer. Well next he applauded our honesty and asked us to send him an amount and he wouldn’t be insulted. He was a young Irish lad heading back to Europe so it had to go.We offered him $800 and 2 days later he accepted the offer. For $800.00 we got the SUV, almost new with all-season tires with 75 % tread left, another set of new studded winter tires mounted on another set of rims, a new 2 gallon gas can and a set of tools. The SUV has heated mirrors, 5 disc CD Player, Cassette Player, power windows and locks, a/c, cruise, tilt, extra console for back seat, cell phone holder, running boards etc. Well done Colleen. The morale of the story is don’t be shy to negotiate! This is my way of giving back to the personal finance community through networking and sharing knowledge with my fans. Today I’d like to welcome Simple Cheap Mom! Simple Cheap Mom is 30-year-old mom who stays at home with her two-year old in their suburban home in Ottawa. Before becoming a mom, she simplified her life, cut her expenses and left her her 9-5 job to start her own professional home based business. Now, she’s a full-time mom and spends her days with her Little Miss making forts, hiding from monsters, and running Simple Cheap Mom. She blogs about her family’s journey to live on one half of their single income and to pay off their mortgage by the time they’re 35 years old. The blog encourages readers to set financial goals, to make plans, and to live within their means. It tackles the emotional side of technical issues, like whether to pay off your mortgage or invest, from one family’s perspective. It also shares the results of the family’s regular challenges to cut unwanted expenses from their budget. So it shows how they cut their own hair at home, how they dry their clothes inside and how they dropped their electricity bill to $50 a month. Simple Cheap Mom doesn’t just give savings tips though. It shares the family of three’s actual budget and gives a big picture view of how a self-proclaimed cheap family spends and splurges. Most personal finance blogs give American solutions, but like Canadian Budget Binder, Simple Cheap Mom is targeted to Canadian readers. If you’d like to read more, go check out Simple Cheap Mom. I do most of the cooking in the CBB house so I guess that means I wear the apron in the kitchen. This weeks Top Recipe goes to my friends over at Kitchen Dreaming who always impress me with their amazing recipes. 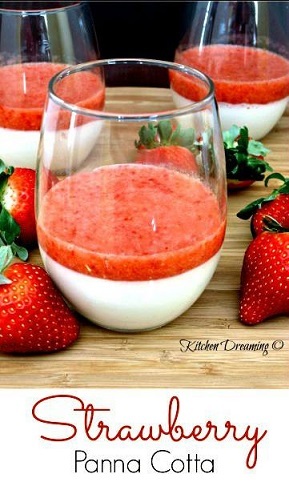 This vibrant coloured Italian Strawberry Panna Cotta is the PERFECT Valentine’s treat for today! Enjoy. Editor’s blog post pick of the week goes to Jessica at Mo Money Mo Houses with Another Week of House Hunting In Toronto~ Jessica and her husband are looking to buy their first house in Toronto which is proving to be exhausting. House buying is not as easy as some people make it especially in bigger cities where houses are on the market for short periods of time and price wars happen. Check out the houses they have looked at and what they plan to do next. Canadian version of Suze Orman– Oh goodness that’s not going to be me. Try Gail! Can I receive a bursary from my work for my husbands education: I’m pretty sure the internet God’s won’t be able to answer that for you. Ask your employer. Where do chickpeas come from?– Here chicky chick chick haha! Thanks again for including me as your MAD Feature this week! Interesting video. We were saving in RRSP’s in our 30’s and 40’s but had to hit that money to survive after hubby had health issues so most of that is gone now. Our daughter has a small RRSP and has a RESP for the grandson’s eduction. He is her priority these days. We enjoy shopping at the Thrift store here in town but I like to look over the cds at the library, so I can borrow any that look good and download on to the laptop, i-pad and i-pod to enjoy later…doesn’t cost me a cent!!! We can pick up dvds to watch free there too. Have a good weekend and enjoy having Monday off!!!!! Amazing how life can throw us curveballs but we make it through. Great idea with going to the library. I’m a sucker for the hard copy of CD’s. Colleen got a great deal on her vehicle and I’m thrilled that she shared it with us. I’m planning on it.. spending the day with the family. You have a great holiday too Christine. Colleen that is a great purchase. Great job negotiating and glad it all worked out. If you able to sell your able to sell your old van you should be able to recoup the $250 tow fee hopefully.